Riker leads the crew through a harrowing dilemma while Picard and Wesley travel together to a planet where they both have personal business. The primary storyline is silly and unfortunate, and hardly worth a mention. 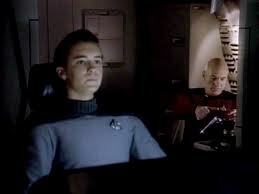 But it gets everyone else out of the way for a great series of moments to materialize between Picard and Wesley. As the episode opens, Pulaski must scold and threaten Picard to convince him to travel somewhere and address some unnamed health concern he’s neglected. Soon, a very cranky and bristly Picard is accompanying an awkward and petrified Wesley as the two take a six-hour shuttle ride alone. As Wes fumbles through attempts at conversation, we soon learn that Picard is having an artificial heart replaced, and that he is very concerned about gossip and his image among the crew at this time. While Picard hides behind gruffness, irritability and a book, Wes offers straightforward honesty, commenting on Picard’s discomfort with him and with children in particular. This leads to Picard reluctantly opening up about life choices, values, and dreams. The two talk about marriage, children, careers, each other, and how Picard lost his heart. Each man is able to shift his feelings of vulnerability into an intimacy with one another. I could go on at some length on how Stewart masterfully moves Picard through an intensely satisfying emotional arc, and how Wheaton’s striving to keep up with him serves his own characterization quite well here. But for now I’ll say that this milestone for Wes and Picard holds a special place in my heart. And Picard’s insistence that the most important things in life will never be on exams might be cliched, but it was a brand new insight to my very lost young self, and one that I savored.